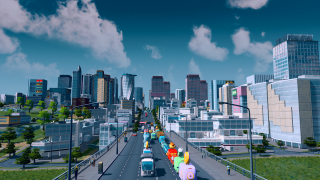 This weekend Cities: Skylines, the city-building sim from Colossal Order and Paradox Interactive, will celebrate its fourth birthday. To mark the event Paradox have shared some numbers. Most notable is the fact that Cities: Skylines has sold six million copies in that time, a thoroughly decent amount for a game of its type. But they also note that players have made 39,733,045 simulated cities with a total combined population of 2,185,317,000,000 people—a number so big it's hard to think about. Special in-game events will be happening over the weekend, including free radio DLC giveaways and a Chirper design competition. As the blog explains, "Share your best Chirper design on the Cities: Skylines social channels for a chance to see it in-game. After entry submissions end on Monday, Colossal Order will add the best Chirpy design into Cities: Skylines for everyone to enjoy."